SOURCE: cropped scans of "Schlummert ein" b. 40 in AMB2 p. 108 (f. 55r) [with absent appoggiatura highlighted] and 113 (f. 59v) from Bach-Digital. Indeed, much of this post is really just speculation, as I do not have much to go on. I remember a moment in a graduate school seminar when I voiced some idea for which I had assembled a similar paucity of evidence, and the professor (rightly) shot it down with the line “That’s not a theory; that’s speculation.” The contempt with which he enunciated the word still sticks with me. For some reason, I enjoy reliving that moment in my memory—maybe because it was an important lesson I needed to learn. I have also written in this blog about the dangers of amateurism in music scholarship—yet I will wallow in amateurism in this post. 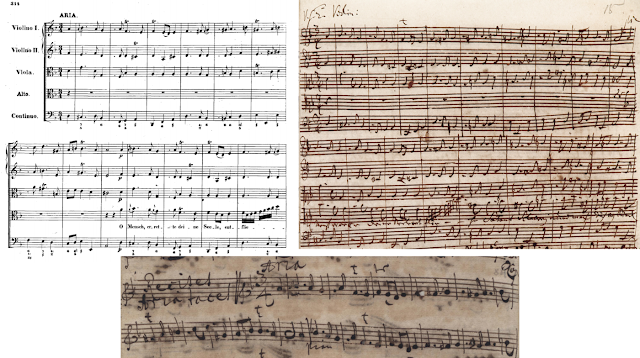 As I’ve said before, I am no Bach scholar; his music is an inevitable topic in a blog such as mine, as the amount of textual research to which his Nachlass has been subjected is truly staggering. There is just so much for me to write about. Like Everest, he’s there. But in this post I find myself writing speculatively, without any underpinnings in the literature. 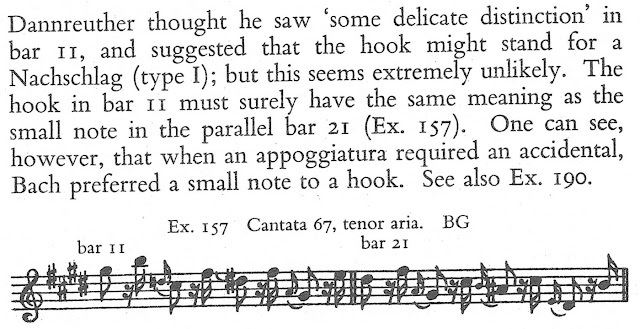 SOURCE: detail of "Vorwort" (p. xiii) to BG vol. 2, from scan available via the IMSLP. 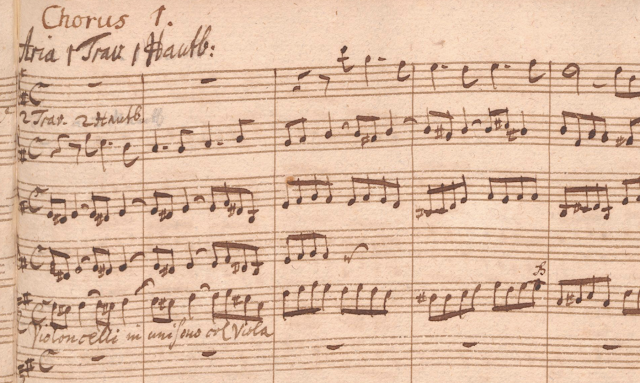 SOURCE: BWV 244 no. 27, bb. 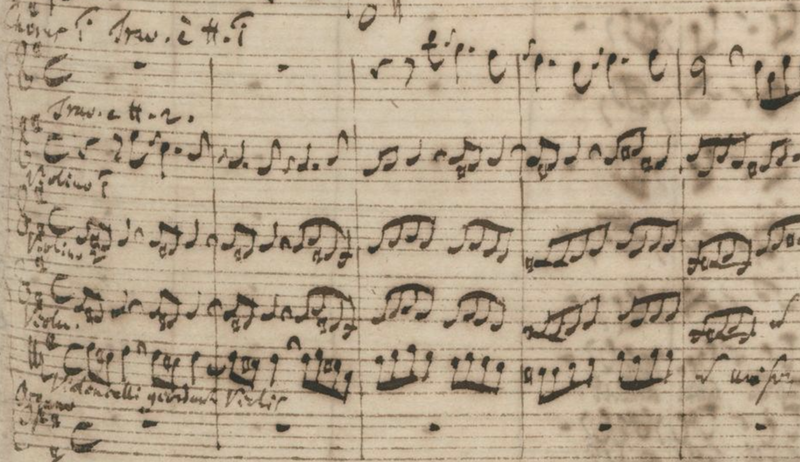 1-5; detail (p. 55) of Bach's fair copy (D-B Mus. ms. Bach P 25) from Bach-Digital. 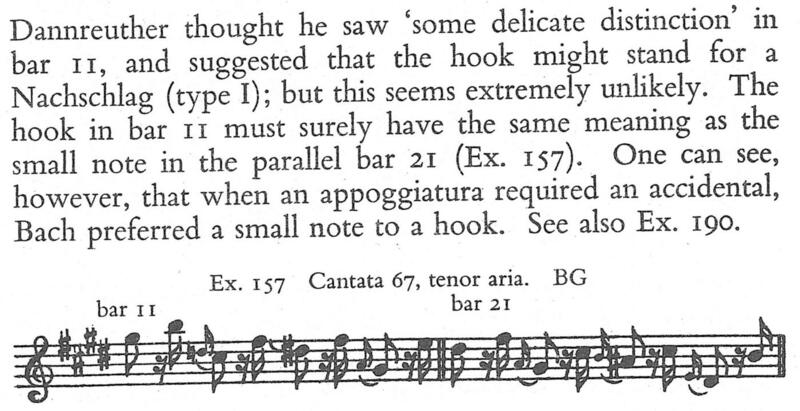 SOURCE: BWV 244b no. 27a, bb. 1-5; detail of copy by J. C. Farlau (D-B Am. B. 6) from Bach-Digital. 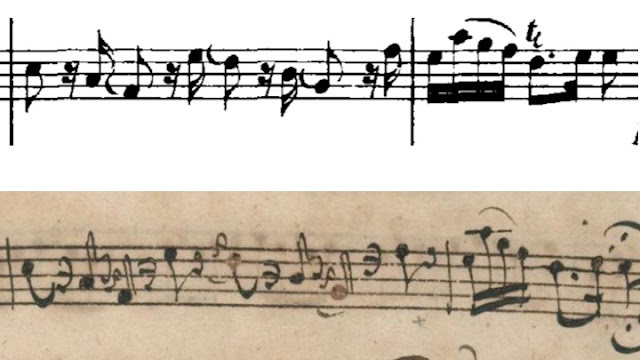 Another imponderable question: do the squiggle ornaments which would then have been written mainly over quarter notes apply also to my putatively new florid line (i.e., resulting in the face-value reading of the page, as it is invariably played now)? Or does the filigree supersede the squiggles (or some of them), themselves mere remnants of a previous version? One thought leads to another, and the suggestions here about BWV 641 strike me as support for those organists who would add ornamentation to another Orgelbüchlein chorale, BWV 639 “Ich ruf zu dir, Herr Jesu Christ,” in which the first half of the chorale is decorated with a few passing tones but the second half is left in bare quarter notes. I have always taken this to mean “you get the idea... go thou and do likewise.” The Orgelbüchlein was explicitly a teaching volume—and, like Bach's other pedagogical works, transmitted not in print but by students (and subsequently their students) copying it out. 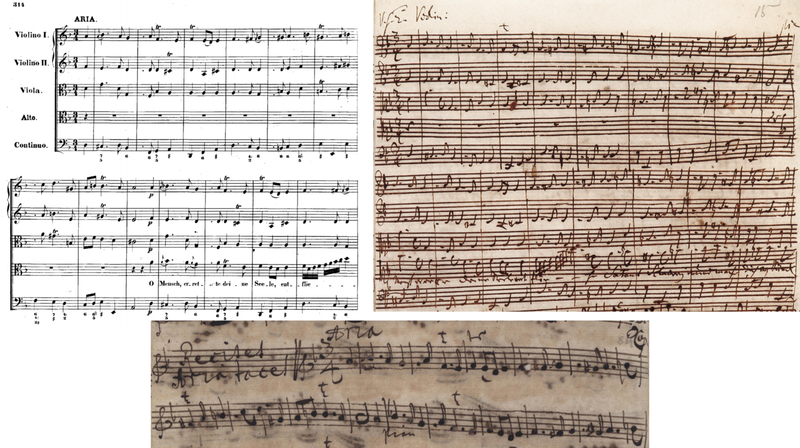 From the NBA critical report for this work and from perusing some of the scans available via Bach-Digital, I see that some of these extant copies (NBA sigla B2, L2 and M1 particularly) do indeed have a few added squiggle ornaments and passing tones in the second half—although, of course, the presence of such decoration on the page is not the prerequisite to the performance of a more decorated version. And so I sit and speculate. 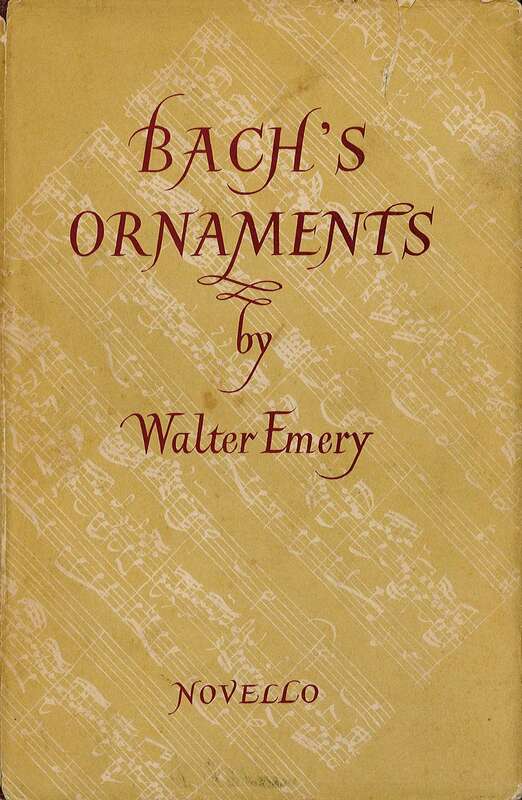 And piece after piece comes before my eyes in which the similar small-note ornament discrepancies recur, although the conditions are never quite the same. It should be noted, for example, that solo music need not have the ornamental details worked out that ensemble music (particularly ripieno parts) would need. 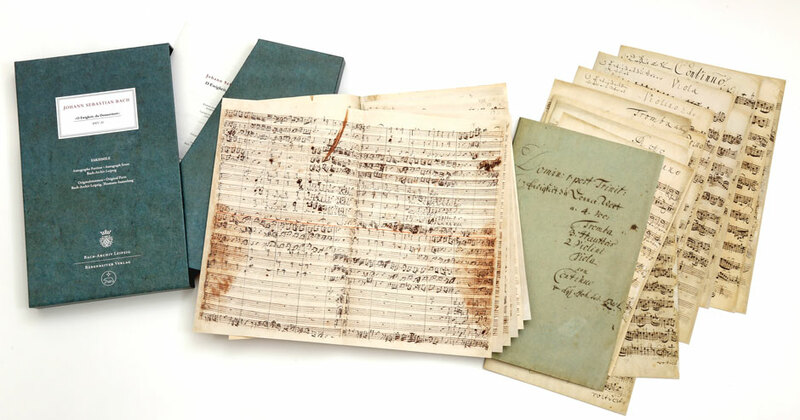 It is also worth keeping in mind that unlike our current rehearsal situation, where a pencil or other writing implement should always be handy, Bach's players may have had no writing implement at hand (surely not any requiring an inkwell! ), and so it paid for ensemble parts to be as carefully prepared as time allowed. 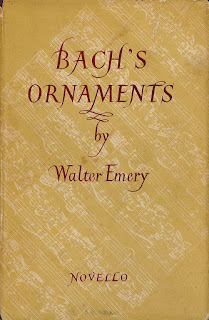 SOURCE: cropped scan of Walter Emery, Bach's Ornaments (Novello, 1953), p. 77. If the BG is to be trusted, he writes, and even before looking up the BG I went straight to Bach-Digital—a resource which gives precisely the “access to large numbers of autograph manuscripts” that Emery craved. There I found a scan of the original Violin I part, copied by J. A. Kuhnau, and what did I see? 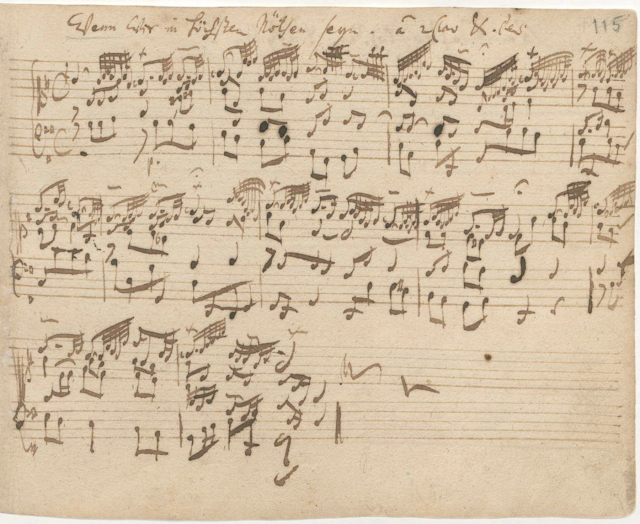 SOURCE: BWV 67/ii b. 5-6; (top) BG vol. XVI, p. 228 (at IMSLP); (bottom) original Vl. I part (as above). Rust actually does this switch inconsistently throughout the aria in both Violin and Oboe lines, and I can see no logic to it. The lesson I take from it, though, is that I don't have the time or the energy to plumb the depths of the small-nib question further. At least for now. Another example to keep in mind: BWV 125/ii: the original parts are preserved replete with small notes; but other sources transmit the presumed reading of the (now lost) score, lacking the graces. See NBA Ser. I Bd. 28.1, pp. 66-74 (cf. 46-54).